Snapchat is aggressively recruiting sales people from Stanford as well as USC for its impending debut of a monetization scheme, we’ve discovered. Meanwhile it’s raising $100 million at a valuation as high as $1 billion to pay them, as well as buy more servers and hire other talent to power its rapidly growing self-destructing messaging app, sources say. Earlier this week Om Malik of GigaOm reported Snapchat was raising $100 million but at a valuation “in excess of a half a billion dollars”, that one source pegged at $700 million post-money. Many of us at TechCrunch had heard rumors of the round, particularly tied to a push in the company’s hiring and monetization. Malik reports that the “founders have settled on an unnamed non-tradition investors (read: hedge-fund)” for this round. However, we’ve heard that’s not totally accurate. Several sources have told us Snapchat co-founders Evan Spiegel and Bobby Murphy are shooting for an even more ambitious valuation near $1 billion. That matches speculation of a higher valuation from Fortune’s Dan Primack. We’ve also heard the company may be in talks with its $13.5 million Series A round leader Benchmark Capital about joining the Series B. We’ve also heard that this round has already closed, but can’t confirm that yet. Some might call the valuation too high, but it’s fueled by Snapchat’s surging popularity and intense engagement, especially amongst young people. 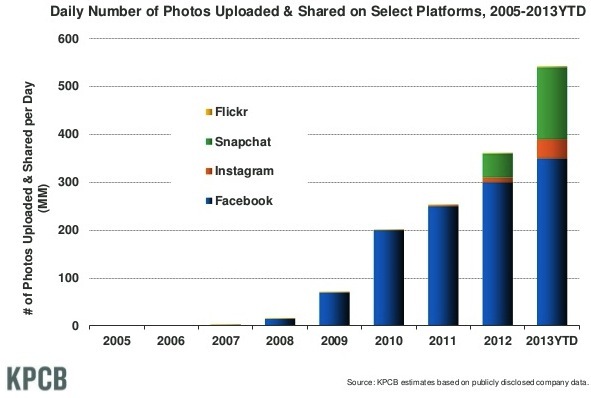 Kleiner Perkins partner Mary Meeker’s latest Internet Trends report said that Snapchat has eclipsed Instagram in volume of photos shared. While Facebook’s acquired photos app sees people share the occasional photo publicly and browse its feed, Snapchat hosts incredible time-in-app as users privately send photo after photo while carrying on multiple conversations with friends. These photos (and videos) delete themselves less than 10-seconds after being viewed, encouraging users to create and send more “Snaps”. The push notifications these ephemeral messages generate lead to frequent return visits. Curiosity about what funny face, current surroundings, or racy imagery their friends have just sent them creates goads people to check Snapchat as soon as their pinged, keeping conversations moving along briskly. All that engagement creates an enormous opportunity for monetization. Snapchat sees this, which is why the Stanford-schooled co-founders of the Los Angeles-based startup have been recruiting at their alma mater, and to a lesser extent their LA neighbor the University Of Southern California. And we’re not talking about just a few salespeople. Perhaps the most interesting tidbit we’ve heard is that the company has been hiring a veritable army of ad sellers. Snapchat is currently at a lean headcount of 12, but has outgrown its Venice beachfront office and will move to a larger office, still in the Los Angeles area. Spiegel told us in our very first interview that the company had plans for monetization, and told us in December that the company was prototyping monetization features. And at the D11 conference, Spiegel said “There will eventually be several revenue streams. He didn’t go into more detail but noted that he thinks ads can “work very well on mobile” and Snapchat’s been playing around with early prototypes. Now, with new funding and new hires, revenue can’t be far behind for the young company. Snapchat has had a strong, loyal user base among high school and college students. I (Billy) remember watching friends at Stanford beta test the app and thinking what a novelty it was that it spread beyond snapping pictures of Palm Drive and Cardinal football tailgates. Now, I look at the “Find Friends” feature of the site and its filled with older family friends, friends’ moms (thankfully not my mom…yet), and more. The explosion in growth the app has seen–users now send 150 million images per day–cannot simply be high school and college students. Snapchat has tipped and is seeing adoption in other age brackets. Josh confirms a recent spike in older, late twenty-something users getting into the irreverent spirit of the app. Meanwhile, after a short honeymoon for Facebook’s ephemeral messaging app Poke, usage of the Snapchat-clone has dried up to mostly just the Facebook employees in his network. Spiegel and co-founder Murphy have carefully selected their media outreach, from exclusives in The New York Times to appearing on The Colbert Report, to reach beyond the classroom types. They want their app to become a household name.